Should I buy a Shopify themes from Envato ? I'm in quite a lot of Shopify groups on facebook and I often encounter questions: should I buy a Shopify theme in Envato? In Envato, Shopify themes often cost between $ 29 and $ 59, which is pretty cheap and affordable for beginners with Shopify. In Shopify, usually, cost $ 120 or more and it's a barrier because not everyone is willing to spend $ 120 to $ 300 on a topic, unless your store is stable and you have money to pay. Although I'm an Envato author, I have to admit that the quality of many Shopify themes is pretty bad, they are almost unqualified before release. Many users buy and are tired of contacting support to fix the error. I have met many authors who published 4-5 products once. That's horrible because none of them work well and the price is quite low (about $ 29), like the authors are trying to get your money. With Shopify theme store, you can rest assured because Shopify controls the quality very carefully and only good products can be sold on it. However, the Shopify team is only interested in design, which means that these products only stop at basic features. While many Shopify themes on Envato have quite a few features or help you save the monthly fee for app. So if you want to buy a good Shopify theme, please use the following factors. 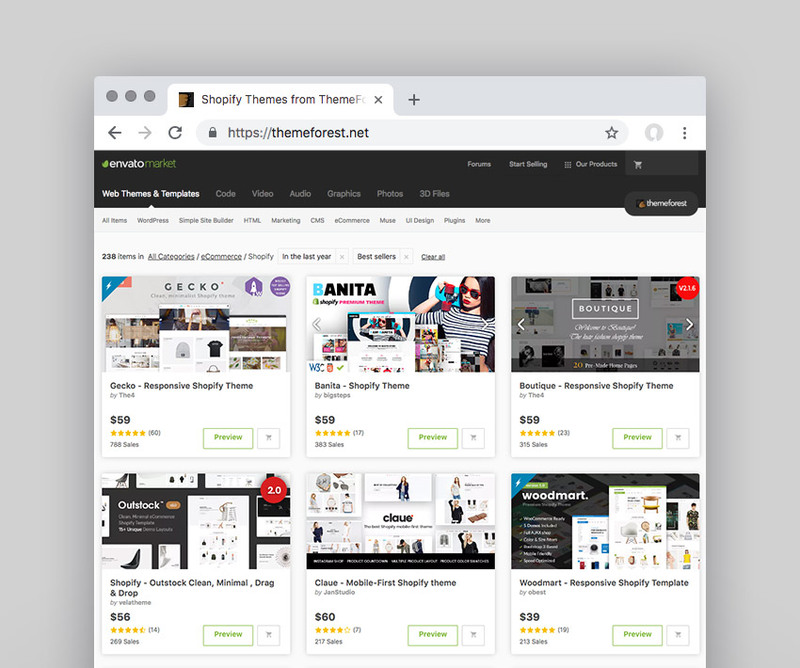 As I mentioned, Envato has many poor quality products but don't worry .... follow these steps to get the best Shopify themes. Here you will find products that are trusted by many users and you can be assured that these products are of good quality. You will see products written by many users and you can read them by going to a product and clicking on the REVIEW tab. Many people suspect that the reviews are fake, but according to Envato's rules, only the person who bought the goods can judge and if Envato finds an assessment that is fraud (ie the author buys their own product and Self-assessment) they will lock this account immediately. If the authors have the Elite or Power Elite badge, so you can temporarily rest assured but in fact many Elite authors are selling a lot of poor quality products, so this is not a top factor to find a good Shopify theme. You can also check the article from Envato about Shopify themes, all of them have a good quality and pick up by Envato team. Above are my opinion on where to buy a Shopify Theme and how to choose a good Shopify theme.